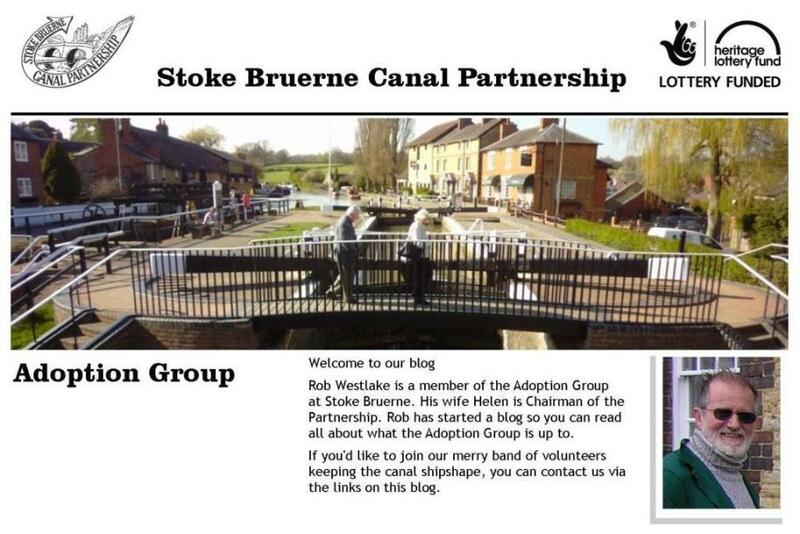 Stoke Bruerne Canal Partnership: WHO planned 2 local working parties on the same day...! WHO planned 2 local working parties on the same day...! 12th March, 2014 by Rob Westlake: Today, the Museum Green was again raked to remove loads of branches and twigs brought down in the recent gales. One group spent the rest of the day up the Woodland Walk - trimming back foliage and brambles and removing a couple of ivy covered fallen trees. Litter and many dog poo bags were cleared up and the leaves rakes off the path. 3 of us spent time down on the long pound, removing overhanging vegetation and brambles and then attacking a couple of huge willow trees - removing dead branches and several branches that were intent on reaching the towpath...! Attached are a couple of lunch break photos - on Kathryn's front doorstep. The gentleman on the left of the first photo is Graham Newman - from Braunston. He's another of Miriam's second in command co-coordinators, as Miriam was with the Northampton IWA Group down at Lock 17. Now - WHO planned 2 local working parties on the same day...! A couple of volunteers spent a good while 'fishing' twigs, branches, pieces of driftwood and float litter out of the cut just above Lock 14 and the blanked off entrance to the 'dry lock'. A good barrowful was retrieved, including an armadillo! What - in the canal at Stoke! It's actually come from the scaffolding that has been erected around the Museum for the external maintenance works. It is a bright yellow scaffold fitting cover, used to protect human heads and limbs from accidental injury from protruding scaffold clip bolts - when on a publicly accessible route.